Francis Donald – Charlie Turner - Pete Wright – Johnny MacMillan – Duke Edmundson- Darren McAusland, Carter Rowney or Stan Neufeld? Any one of the above would be a good guess. I suspect many of our readers might have selected Carter Rowney since he was on the Pittsburgh Penguin roster last hockey season when they won the cup. He did not have possession of the coveted ring when he brought the Cup to Sexsmith in July. 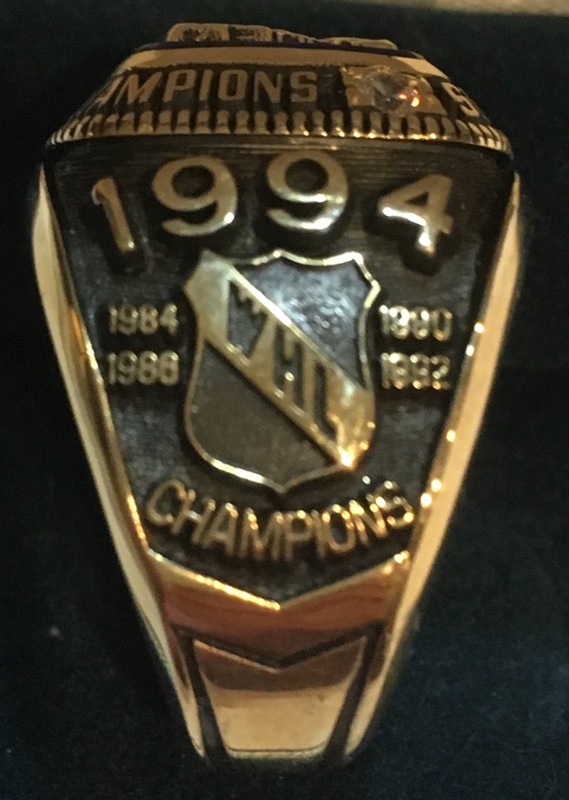 He has since received it but was he the first local player to wear a ring? (Under Stories see “SMALL TOWN TO BIG TIME, DUGOUTS TO FORUMS: THE STORY OF CARTER AND THE CUP”). Carter Rowney and his Stanley Cup ring. Photo courtesy of Carter Rowney. Darren McAusland GP Hockey Legend would be another good guess. He made an appearance in the NHL and he sports a hockey ring. (Under Stories see “FROM PONDS TO THE PROS, DARREN MCAUSLAND”). Following are Darren’s comments about his Calder cup ring. “The ring I have is a 1994 Calder Cup Championship ring that I won as a member of the Portland Pirates in the 1993/1994 season in the American Hockey League. We had a loaded team and were the minor league team for the Washington Capitals. I played about 61 games in the regular season but only a couple in the playoffs due to our team being so deep. I was 21 years old when we won. That team included Olaf Kolzig, Byron Dafoe, Sergei Gonchar, Jason Woolley, Jason Allison, Ken Klee, Andrew Brunette, Kevin Kaminski, Kerry Clark (Wendel's brother), Brian Curran..etc.. I was so young I didn't even appreciate the time enough but it was still a special thing to be a part of. We had a 20 year reunion back in 2014.” (Stan Neufeld Interview). 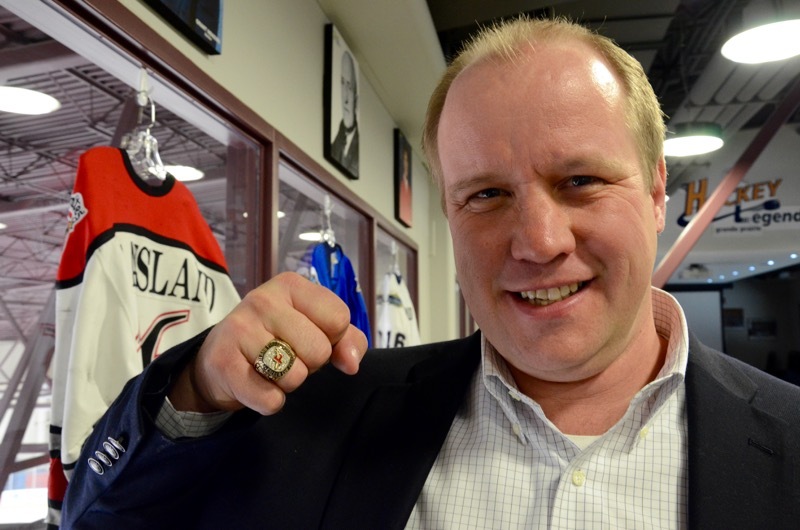 Darren McAusland and his Calder Cup ring from 1994. Stan Neufeld photo. Duke Edmundson may have been your choice. He played for the Leafs when they were a dominating presence during the era of the original six NHL teams and he came close to earning a ring but not close enough. If you chose Francis Donald you know something about distant history in Grande Prairie. He was the first Grande Prairie hockey player to make it to the pros. If you are ill informed about GP hockey history you might have chosen “Yours Truly”, Stan Neufeld. Ah well - my name after all is Stanley and I’m almost old enough to think that maybe they named the cup after me!!!!! I have a Stanley Cup popcorn popper. Does that count? “Nope” is the answer to all of the above but we do have to go back a few years for the correct guess – 55 to be exact. THE CORRECT ANSWER --------- JOHNNY MACMILLAN. So - who is Johnny MacMillan? If you are familiar with GP Hockey Legends that have already been inducted you will know something about him. As a die-hard Leaf fan I have a special interest in him, the Leaf teams with whom he played and his story about the rings. Johnny became a GP Hockey legend in 2005 in the Player category along with Marv Bird and my brother Bob Neufeld (Builder category). 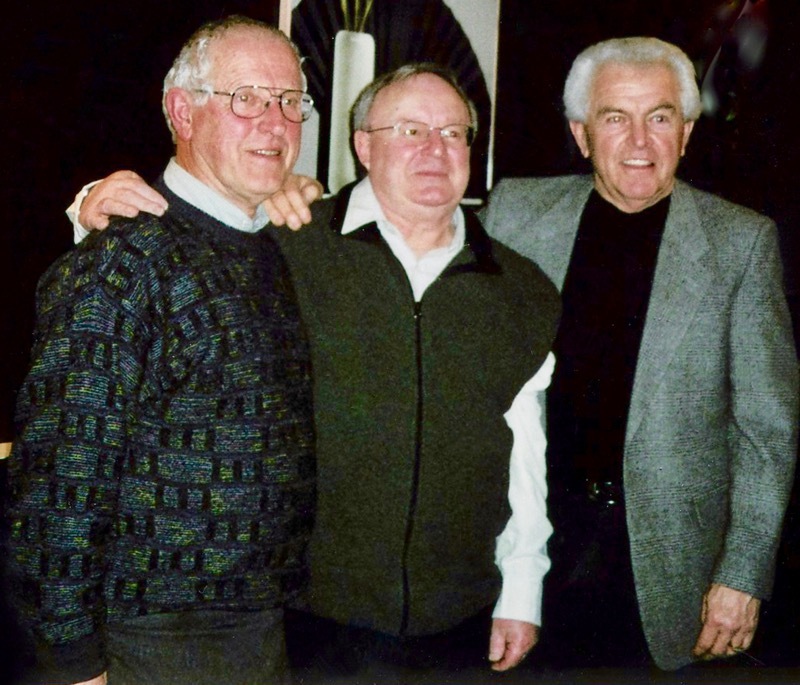 Bob Neufeld, Marv Bird and Johnny MacMillan became GP Hockey Legends in 2005. Photo courtesy of Marv Bird. Johnny was born in Lethbridge but the family moved to Grande Prairie in 1972 when he was seven years old. The foundation for Johnny’s hockey skills that led eventually to the NHL and membership on an original six Stanley Cup championship team was developed in Grande Prairie. He was a contemporary of and played hockey with both Duke Edmundson and my Brother Ron who attests to his remarkable ability. Following is Johnny’s story as recounted to Stan Neufeld during an interview in 2004. “From 1942-1946 I played hockey on the post-War Legion team organized by Max Henning, Billy Bessent and other veterans who had returned home following WW11. We played mostly in the old Wapiti Arena along with numerous other teams coached by Legend Johnny Macdonald. I was a “rink rat” and I used to wear a sandwich board and walk the wooden sidewalks of Richmond Avenue in Grande Prairie to advertise games on a Saturday night along with Bob Rigler, Bruce Miller, and Gerald Chalmers while Don Patterson rang a cowbell. I received free admission to the senior games by keeping the scoreboard and then got to watch Pete Wright, Duke Edmundson, Ken Head, Bob Kelly, Chester Walden and Charlie Turner. I think it was in 1947 or 1948 that the Wapiti Arena roof caved in so we were without a covered ice surface. We skated on an open-air rink behind the Catholic school and we had fierce competition between Catholics and Protestants - wow! We would sometimes get my Dad to drive us to the local airport where we played in an old warehouse. Bear Creek was also a favourite place where we could skate for miles at night with a bon fire burning on the shore to provide light and warmth. In 1949-50 I played with the Army Cadets along with Bob Rigler, Donald Patterson, Mike Malarchuk, Bruce Miller, Victor Rigler and Bryan Edmundson. We were coached by RCMP officer, Frank Smith and Frank Edmundson. Back row from left: Frank Edmundson,coach, Leo Auger, Albert Cave, Donald Patterson, Roy Blais, C.J.Red Storey, Bruce Miller, Tom Leslie. Front row from left: Wally Haakstad, Lawrence Blais, Johnny Listhaeghe, Don Miller, Bob Rigler, Vic Rigler, Johnny MacMillan, Eddy Klick, Brian Nelson. Missing Bryan Edmundson and Maurice Nicholson. Photo courtesy of the Rigler family. In 1950 I moved with my family to Warner, Alberta, south of Lethbridge. They had an outdoor rink but no organized hockey. My parents let me move back to Grande Prairie in 1951 at the age of 15 where I continued my high school education. Grande Prairie Legion 1950-51. Stan Neufeld photo collection. Back row: Walt Hiekkila, Gordon Bond, Don Swanston, Harold Ayre, Deb Crough, John Lynn(mgr.) Robert Card, Charlie Turner, Ernie Nelson, Roy Wright, John Listhaeghe. Front row: Ron Neufeld, Bob Rigler, Johnny MacMillan, Fred Anderson, Lou Giroux, Jerry Moore, Kelly Schiekle. I worked for J.W. Bird at his grocery store to earn spending money and pay for my room and board. In 1952-53 I played with the Red Devils. 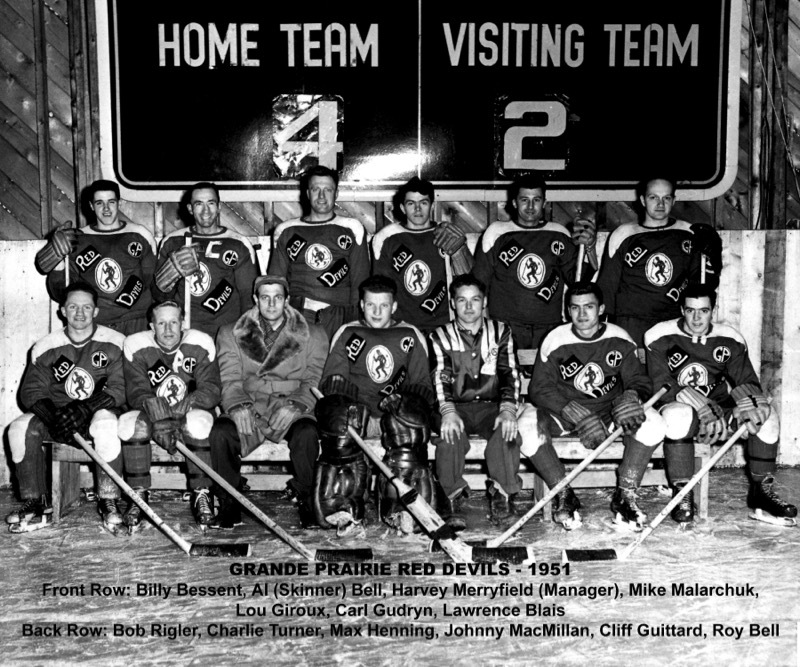 Grande Prairie Red Devils 1951. Stan Neufeld photo collection. Legend Max Henning was our playing coach and if I remember correctly the Manager was Harry Merryfield. Teammates included Bob Rigler, Bruce Miller, Mike Malarchuk, Bryan Edmundson, Roy and Lawrence Blais and Hockey Legends Leo Auger, Oscar Blais and Charlie Turner. In 1953 I left Grande Prairie to play for the Lethbridge Native Sons a team that competed in the old Western Canada Junior Hockey League. I played with them until 1956 and then went to the University of Denver to play for the U of D Pioneers, a team that was coached by the legendary Murray Armstrong. We had two championship teams during my time in Denver. In my final year, as Captain of the team we won the League Championship.” (Stan Neufeld interview with Johnny McMillan – 2004). Johnny moved from Denver to become a member of the Leaf’s second dynasty as one of the original six NHL teams. As a young forward in 1960-61 Johnny scored three goals and was a solid contributor on a checking line with Bob Pulford and Ron Stewart. He started the next season in the AHL but was recalled half way through the schedule to serve as a utility forward. That spring MacMillan played three playoff games helping Toronto win its first of three straight Stanley Cups. Toronto Maple Leafs, Stanley Cup champions, 1961-62. Johnny MacMillan is in back row far right. 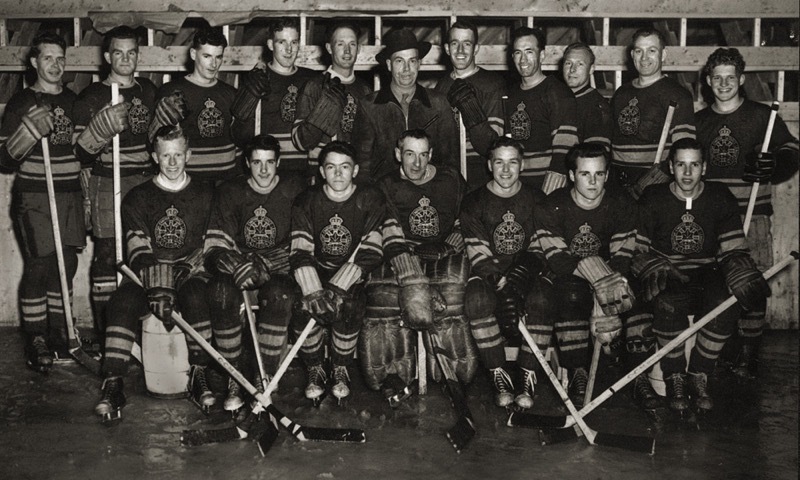 Toronto's first dynasty was in the 1940s winning the Cup in 1942, 45, 47, 48 and 49. 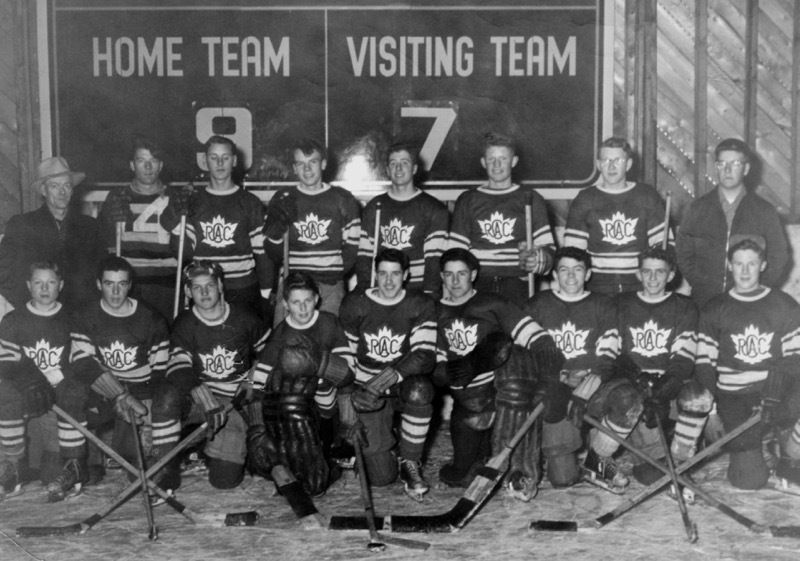 In the 1950s, Maple Leaf fans would celebrate one more title before an extended drought. In 1950-51, thanks to Bill Barilko's overtime Cup winning tally in game five, Toronto defeated Montreal to claim their only championship during that decade. It was another eleven years before Leaf teams brought back the Cup and Johnny was an important contributor for two of those years. Interestingly in 1960-61 one of Johnny’s teammates was another Grande Prairie product: Hockey Legend, Duke Edmundson. Like Carter Rowney who last season won a ring as a Pittsburg Penguin Duke was born in Sexsmith. The family moved to Grande Prairie when Duke was a pre-schooler and there he played his early hockey and although Duke was a couple of years older than Johnny they often crossed paths. 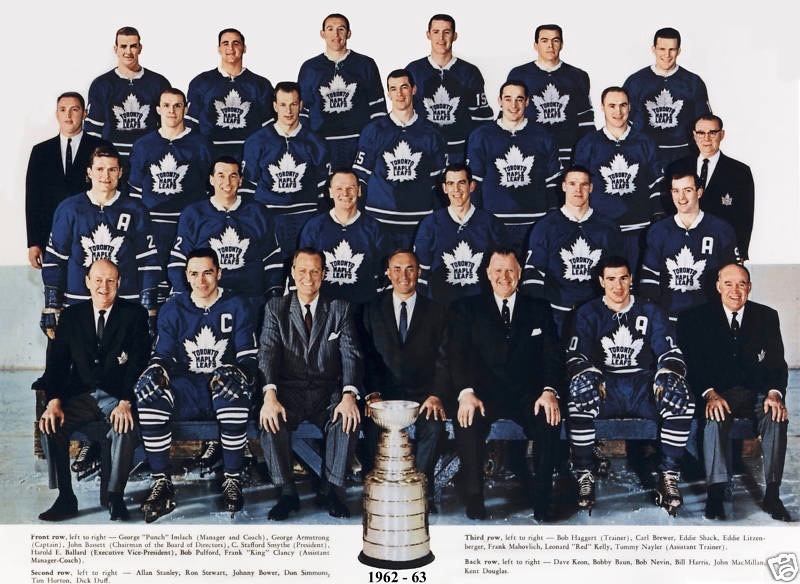 Toronto Maple Leafs, Stanley Cup champions, 1962-63. Johnny MacMillan is in back row second from right. 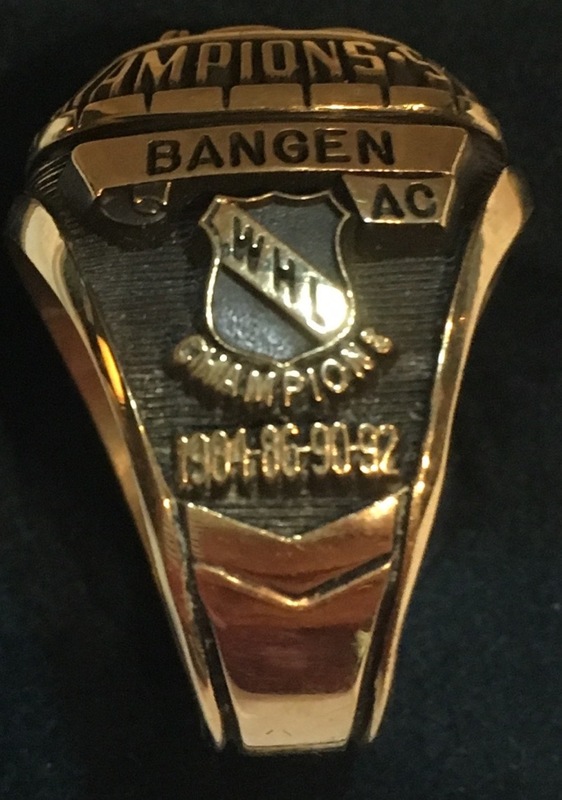 It took fifty-two years and the insistent lobbying of Johnny Bower, Bobby Pulford and other members of the “no ring” contingent to be awarded the additional rings they deserved. At a three-day “Fan Fest” prior to the Leaf’s 2014/15 season presentations of the additional rings were made. Following is a photo of Johnny MacMillan’s second ring. 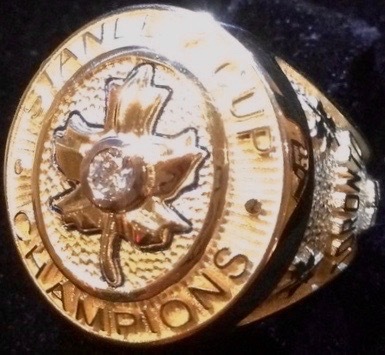 Johnny’s Stanley Cup ring with the Leafs. Photo courtesy of Johnny MacMillan. If there is anything a Stanley Cup winner wants as much as seeing his name on the Stanley Cup it is to own a Stanley Cup ring. Rings are a constant personal reminder of participation on a team that has won the Holy Grail of hockey. It is a reminder that a player has attained the dream of every NHL player. Johnny attained that dream twice and has two rings to show for it. The history of the ring dates back to 1893 – the first year of the Stanley Cup. I don’t know what the cost of producing a Stanley Cup ring was in 1893 but today the cost is $20.000.00 - $25,000.00. As it relates to Johnny - in the 1950’s a two-year contract and two rings represented a significant expense as the team winning the Stanley Cup had to build the cost of rings into their budget. That’s approximately $1 million. Whatever the cost of rings in Johnny’s era, team management determined to reduce their operating budget at the expense of the players. In the long run their decision did not pay off. They lost a substantial measure of good will from players that participated on more than one winning Stanley Cup team. In the final analysis it is to the Leaf’s credit that they eventually corrected a misguided decision. An interesting aside is that in 1971 the Montreal Canadiens gave players television sets instead of rings. Really? I wonder how the players on that team feel about that decision today? Is anyone willing to trade a Stanley Cup ring for a TV? 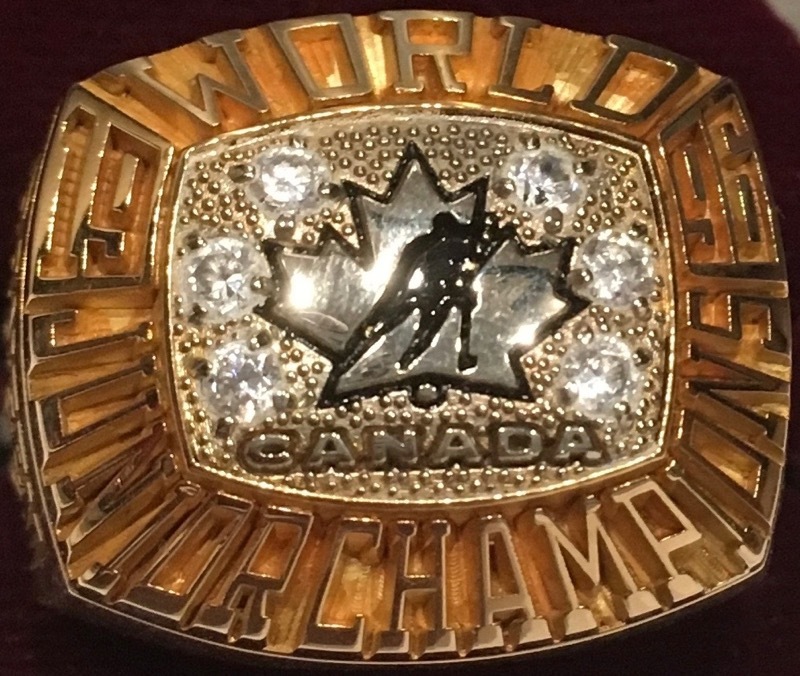 Considering hockey players from Grande Prairie – who do you think has won the most rings? I won’t belabour the point but will wager that it is GP Hockey Legend Terry Bangen. 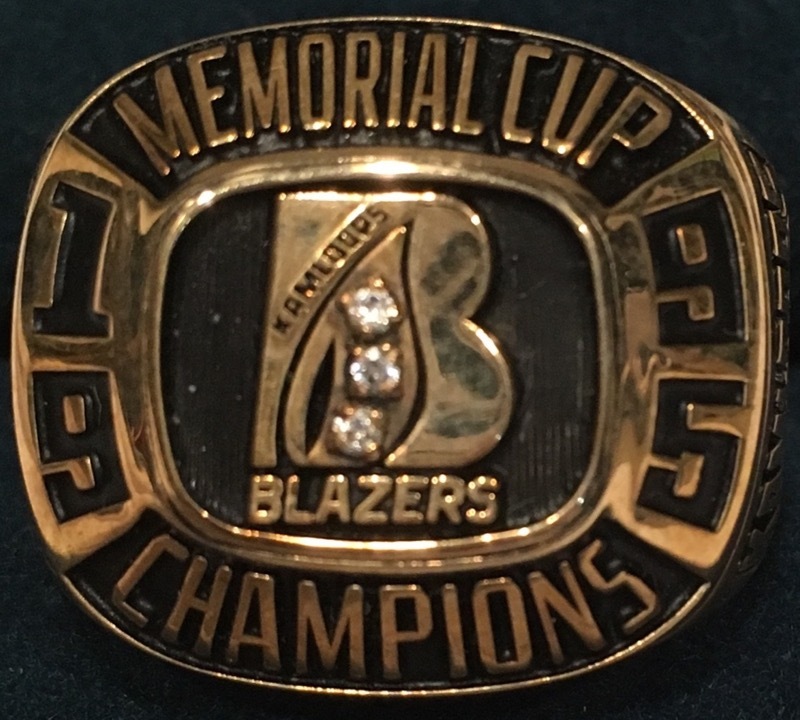 They are not Stanley Cup rings but Terry had a remarkable junior career with Kamloops Blazers, a team that won three Memorial Cup Championships when he was on the coaching staff along with Ken Hitchcock and Tom Renny. Terry earned a fourth ring as a member of the Team Canada coaching staff in 1996 when they won the World Junior Championship playing the final match against Sweden. As far as we know Terry is the most “be-jewelled” player coming out of Grande Priairie. Terry has and continues to make monumental contributions to the world of hockey that we intend to review in another context. He is presently Assistant Coach with the Worchester Railers of the ECHL. We are proud to claim Terry as a Grande Prairie product. He was inducted as a GP Hockey Legend under the Builder category in 2008. Photos courtesy of the Bangen family. 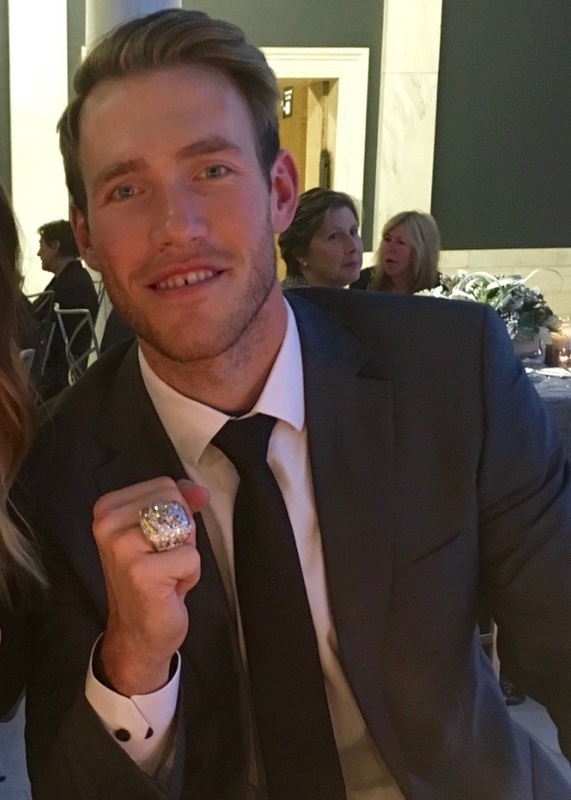 As noted above the most recent Stanley Cup ring was won by a Sexsmith/Grande Prairie product, Carter Rowney. He was unable to show it off when he visited his home town with the cup but he has since received it. Last year “Just Play” was engraved on the ring. I wonder what slogan appears on the present ring? Also I wonder if Carter, Johnny and Terry wear their rings regularly? The dollar value of a ring is significant but that is eclipsed by its sentimental value. Losing a ring would be a disaster. To secure rings from loss or theft I wonder how many players secure their rings in safety deposit boxes or lock them in display cases in order to minimize the risk of loss? Wherever they are - their rings are tangible reminders of their hockey journey to the top.